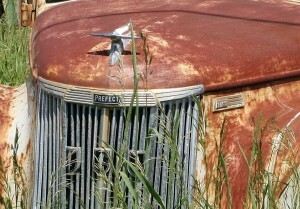 Pre-1953 Ford Prefect, spotted in Kazabazua, Quebec. When your average North American thinks of a British car, it’s usually an image of a Jaguar, Rover, Austin, Lotus or MG that pops into their head. Those classic English marques definitely made an impact on both sides of the pond, but Ford of Britain should get credit for dutifully cranking out staid and sensible vehicles for the driveway of the everyman. It’s hard to imagine now, but for decades, Ford of Britain marketed their vehicles in the U.S. and Canada alongside their more familiar counterparts from Detroit. This was especially prevalent in the early postwar period and 1950s, as the British models undercut the American models in price by quite a bit. The Prefect’s 1.17-litre engine made a whopping 31 horsepower. They also undercut them in power, comfort, and size. The Ford Prefect was a big name among British cars. As an uplevel version of the Ford Popular and Ford Anglia (naming models wasn’t their strong suit), the Prefect was introduced in 1938 and continued in production – minus a three year gap to accommodate a pesky global conflict – until 1961. Following World War 2, a devastated England geared up its factories, and, using existing dies, tools and plans, built and exported cars to save its financial life. Ford of Britain sales and service networks were set up in North America to handle the influx (Latin America and Australia being other big customers). 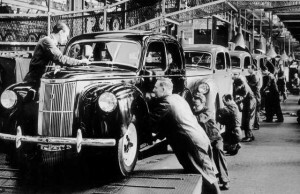 Per capita, the British Fords proved more popular in Canada than the U.S.
Ford of Britain workers are seen constructing Prefects in 1950. Whether it was the Commonwealth factor or the long-standing love affair with domestic vehicles south of the border, Canada’s sparse population soaked up 235,000 British Fords between 1948 and 1973. 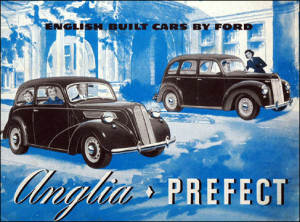 In 1950 alone, a Baby Boom-era Canada bought up 14,804 British Fords, a good number of them Prefects. Your author’s mother often recalled the Prefect of her Alberta youth, one of several British imports purchased by her budget-minded father (the others being an Austin and a Vauxhall). Throughout the model’s run, the body received only one significant upgrade – in 1953, when the upright, pre-war look was ditched for something more contemporary. The mechanics of the Prefect were as basic as you could get, and wouldn’t win you any races. The only powerplant available was a side-valve 1.17-litre four cylinder making 31 horsepower and 46 foot-pounds of torque, mated to a three-speed manual transmission. Vintage North American ad for British Ford cars. Compared to the V8-powered American Fords of the same time period, the Prefect seemed to have more in common with the Model T (especially considering that it retained the capacity for crank-starting). With a top speed of about 65 miles per hour (105 km/h), you wouldn’t want to try passing logging trucks in the Rocky Mountains in a Prefect. But, driving a Prefect was better than not driving at all, hence why British imports became popular with the cost-conscious. 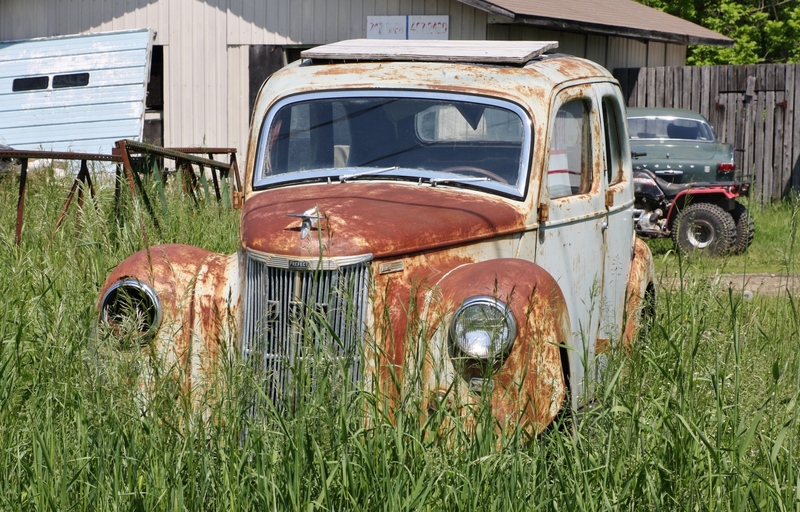 Despite the number of vehicles sold here in the Great White North, British Fords are scarce. The Prefect at the centre of this post, spotted in a field near Kazabazua, Quebec, was a rare surprise. While the model itself is far from the minds of modern-day Canadians (and Brits), the Prefect gained lasting recognition after a confused main character in Douglas Adams’ The Hitchhiker’s Guide to the Galaxy adopted the car’s name in an effort to appear “inconspicuous” among locals. This entry was posted in Spotted in the wild and tagged Anglia, Ford, Ford of Britain, Ford Prefect on March 6, 2015 by Steph Willems.